Sally Mauk: Welcome to "Campaign Beat" our weekly political analysis program. I'm Sally Mauk and I'm joined by University of Montana Political Science Professor Rob Saldin and veteran Capitol Reporter Chuck Johnson. And Chuck, a super PAC called the Senate Leadership Fund with ties to Senate Majority Leader Mitch McConnell has a new ad out on social media attacking Senator Jon Tester as "just another Washington liberal." And this is likely, Chuck, don't you think, just the first of what will be several dark money sponsored ads in this race? Chuck Johnson: I would say a torrent of dark money ads against Tester, Sally, not just a couple. This is the first of a landslide worth of them. SM: Let's listen to the ad. Senate Leadership Fund Ad: "Jon Tester thinks that crew cut of his makes him one of us. Ha, ha, ha. A crew cut doesn't make you a Montana conservative Jon. Not when you vote with Elizabeth Warren to shut down the government or join Bernie Sanders to put illegal immigrants over sick kids in Montana. Nope. Not when you vote with Nancy Pelosi on EPA regulations that hurt Montana farmers. And especially when you vote with Barack Obama 93 percent of the time but only 37 percent with President Trump. So cut the crew-cut coverup Jon, because underneath you've become just another Washington liberal." SM: And Chuck, the visuals in this ad are a hoot. They show Elizabeth Warren, Nancy Pelosi, Bernie Sanders and Barack Obama all with flat top haircuts like Tester has. Pretty effective. CJ: It's a pretty effective ad, Sally. I think it makes the point we're going to hear often that Jon Tester is not a conservative as he might say in Montana — or at least they say he might say in Montana — but has fallen in with the Washington liberal crowd. And the haircut is a device that has been used against Tester both in 2006 and 2012. So they're not cutting any new hair here but it's cleverly done, and the buzz cut that everyone gets — except Donald Trump I might mention, he's not pictured and he doesn't get a haircut even though he might need one. It's a clever ad. It's certainly the major theme, I think, of the Republican campaign against Jon Tester is that he's not a conservative, he's gone to Washington, he's a Washington liberal. SM: All right, and we should point out Tester's responded this way that he's had this haircut long before he became a politician. It's not an affectation. CJ: I've never seen Jon Tester without a crew cut or flattop. SM: Meanwhile Tester's campaign, Chuck, has started a women for Tester group aimed at getting women out to vote for him. And here's what the senator had to say about that. "Women are absolutely critical part of the electorate that I need. SM: He's right about that Chuck. CJ: There's no question about that. He's making a concerted effort to get them. I think he probably has in past campaigns but maybe not as outwardly as this. But, he needs women to win. No question about it. SM: And he's riding the wave of galvanizing of women this election year, right? With all the women's marches; those protests marches that were statewide, in Helena, and then held around in different communities recently, those have all been organized by women who heretofore may not have been terribly politically active and now are. He's hoping to ride that wave I think. CJ: No question about that. And I think he's definitely got connections through his campaign people and supporters that he will tie into those groups as best he can. 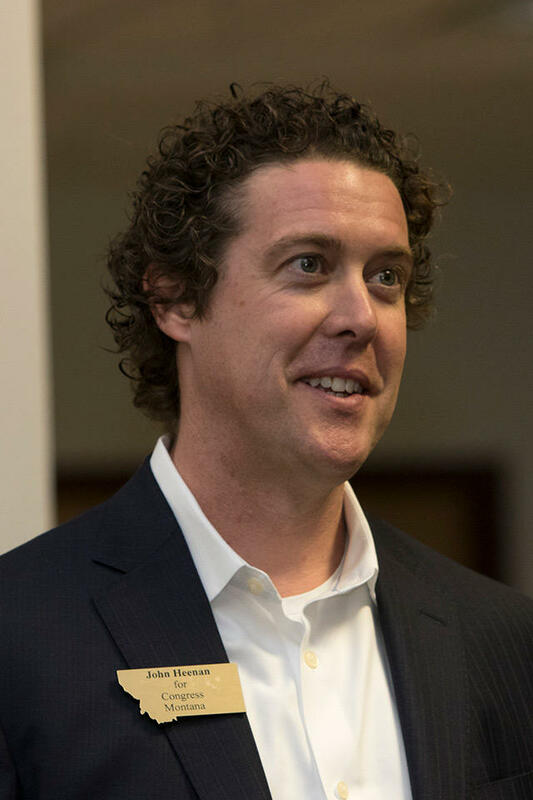 SM: Switching to the House race, Rob. The five Democrats hoping to unseat Republican Greg Gianforte held a forum in Missoula this week. And even though they have a lot in common in terms of their policy positions, I think the forum gave the several hundred people in attendance a clear view of each of the candidates' strengths and weaknesses. 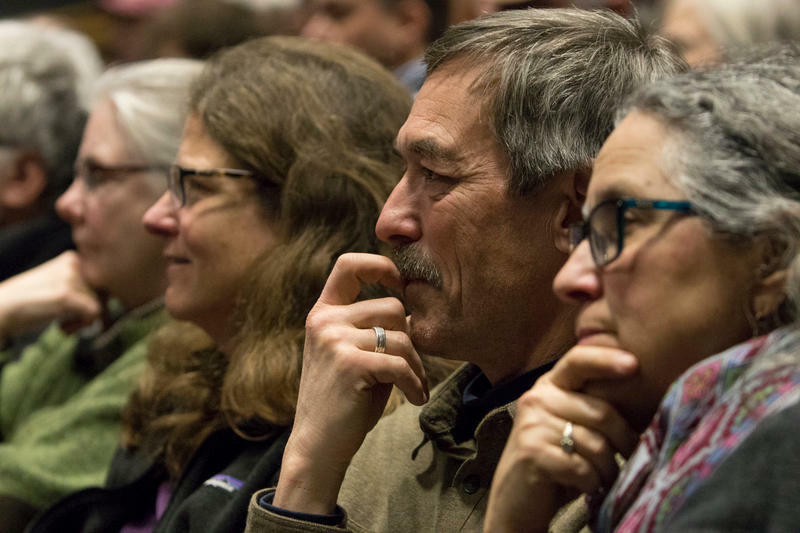 More than 800 people attended the Democrat's candidate forum in Missoula Thursday night, Feb. 8, 2018. Rob Saldin: I think so Sally. A few things that stood out. I thought from Lynda Moss, Kathleen Williams, Grant Kier, we heard some pretty compelling personal history stories that I think were effective at introducing those candidates to the voters and presenting themselves as real people, not just sort of candidates with policy positions. Jared Pettinato, I think, we got a clear sense of what his campaign is about. He knows a lot about public land and energy issues. He's a pretty good orator. From Heenan I think the thing that stood out, as we've talked about before, is just that he presents himself in this fighter mold, someone like Bernie Sanders and Elizabeth Warren. SM: And Kathleen Williams made a clear pitch to be the successor to Jeannette Rankin. That line got a strong applause. RS: That's right. She hit on the gender issue a number of times throughout the night as she has throughout the campaign. SM: John Heenan and Grant Kier are the front-runners in terms of money raised and they, I think, got in a couple of subtle digs at each other at this forum. "Let me be clear: I'm not the establishment candidate in this race. No one from Helena selected me to run. And I'm proud of that." SM: And Rob I'm guessing he's implying Kier is the establishment candidate. RS: Yeah definitely. At another point he said the establishment Democratic Party has lost its way and that's why we keep losing. Right, so he's clearly presenting himself as an outsider candidate. And I think one big advantage he has is that he's really cornered the market on that space since Tom Woods dropped out of the race back at the end of December or early January. So all of the other candidates to one degree or another present themselves as eager to work across the aisle, to find common ground, right. Heenan doesn't talk like that at all. He says basically the American political system is corrupt. It's controlled by greedy elites. There are good guys and bad guys. And he's going to fight like hell on behalf of the good guys. And that's a very powerful strain of thought in American politics today on both the left and the right. And my sense is that message is one that really resonates with progressive Democrats, with the base. And again, he's the only candidate with that message. SM: At another point in the form that candidates were asked if elected if they would join that Congressional Progressive Caucus that Bernie Sanders and others belonged to. Heenan said, "Yes. Hell yes." Here's how Kier responded. "I want to be clear I'm running for this race to represent Montanans, plain and simple, not to join a certain club or have belonged to a group." SM: Kier, it seems to me Rob, clearly wants to not wear the left progressive label. RS: Right. I think one of the things that Kier's campaign is banking on is that Democrats will ask themselves, 'who is the most electable among these candidates. Who has the best chance to beat Greg Gianforte in the general election.' I think that's really the big question in this campaign. So as I was saying before, Heenan's message, I think, works very well in terms of speaking to Democrats in their heart, right. In their heart, you know, I think Heenan is a fighter, presents himself as a fighter. That resonates very well with progressives. But then there's also this question that Democrats will have to ask themselves: is that message going to work in a general election? If this is our candidate who is the most likely to win? And Kier, I think is clearly not going to associate himself with the Progressive Caucus which includes Bernie Sanders and the progressive wing of the House caucus. That's not Grant Kier, right. It is John Heenan. Heenan says that what Democrats really need is to offer a clear choice, a distinction between themselves and the Republicans, not to just be some warmed over version of the Republican Party, right. Kier rejects that. 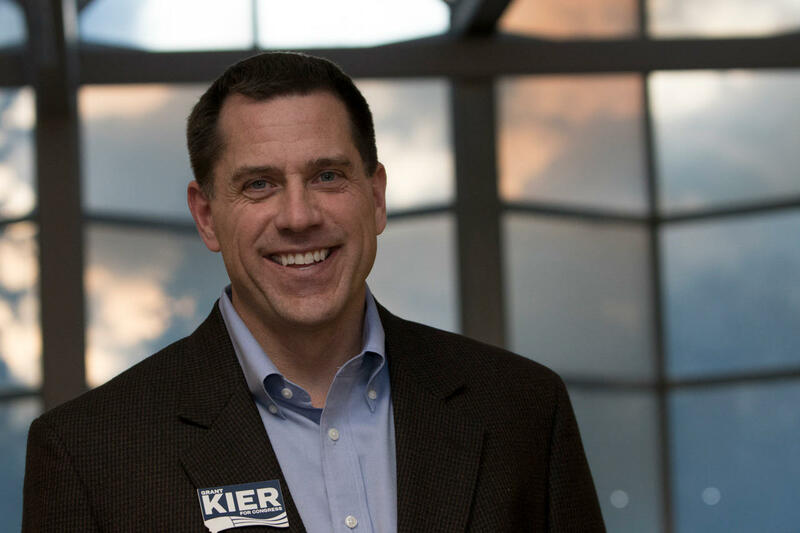 And Kier's campaign, I think to some degree, is based on the fact that he is the one in the best position to defeat Greg Gianforte in the fall. SM: Well meanwhile Greg Gianforte admitted this week in an interview that he has ditched an earlier pledge not to take any corporate PAC money and is in fact accepting that money now. RS: Yeah, and you know, he made such a big deal about this during his run for governor. Posing as some kind of noble hero who couldn't be bought by outside interests. RS: That was part of the deal. He's very wealthy and he poured something like six million dollars of his own money into that run for governor. So he just didn't need to rely on fundraising as much as most candidates do. But the other thing here is that challengers in general usually aren't in a position to be bringing in all that much corporate PAC money to begin with. Most of that type of funding flows to incumbents. So in his previous run, Gianforte could make that kind of heroic pledge and claim the moral high ground knowing that he wasn't really forgoing all that much money. But to do that now when he's a sitting member of Congress, he'd be turning his back on a lot more cash than would have been on the table in his previous runs. So he's in a different position now. The calculations have changed and that's all fine, that's normal, that's how the game is played. He's not breaking any rules, but it does kind of underscore the high roller nature of his previous stance as a martyr on this issue. SM: Chuck, also this week Governor Steve Bullock, in a couple of interviews, stuck a few more toes in the presidential waters. Not ruling out that he might run for the top job in the country in 2020. CJ: Yes he did a couple of interviews and he's clearly starting to wade out a little deeper and the water, maybe knee-high now. I don't know if it's just toe-high, but he talked about how he wants to tell Montana's message to other states, how he's been able to work with both sides to get things done. Which of course is somewhat true somewhat not. He's had quite a feud going with Republicans and vice versa over the state budget. But in any event, he's on the speaking circuit and one of the stories he said he's going to be the guest speaker at the Colorado Democratic Party, a big dinner in the coming weeks. And he's done this in Nevada as well, so he's getting out there for sure. I think he figures, why not. The other thing that I thought was very interesting is he was asked about whether he was just doing this to generate some interest in a 2020 Senate campaign against Steve Daines, and for the first time that I've seen, he basically said, no, the Senate race doesn't really interest me. He said he's been an executive branch official as attorney general for four years, and he'll have gotten two terms or eight years in as governor when he concludes, and that he likes offices where you can do things and he doesn't think the Senate really does things. So I thought that was interesting too. SM: I'm sure Steve Daines thought that was interesting too. Finally the most bizarre political story of the week came out of Havre, where Republican Senate candidate James Dean, whose wife Sarah is also running but as a Democrat, Mr Dean caused a school in Havre to go into lockdown when he tried to pull his children out of the school. He's apparently involved in a nasty custody dispute with his ex-wife. But this is a story that gets stranger and stranger I think. RS: Yeah absolutely. Where can this go from here? You know, to say the least, this is not something that bodes well for his Senate candidacy or his wife's Senate candidacy. SM: Rob, meanwhile, the Deans, have reportedly moved out of Havre to an undisclosed location. How can you run for the Senate and people not know where you're living? RS: Well it's an unconventional move. CJ: Well they have to put down an address when they file for office, and to my knowledge they haven't paid the filing fee yet to officially file. And I wonder if they really will. But who knows where they're living. We haven't heard anything lately. RS: They may have bigger things to worry about. SM: Right, but they are still maintaining that they're in the race. So we'll see where that goes. And keep following that story for sure. 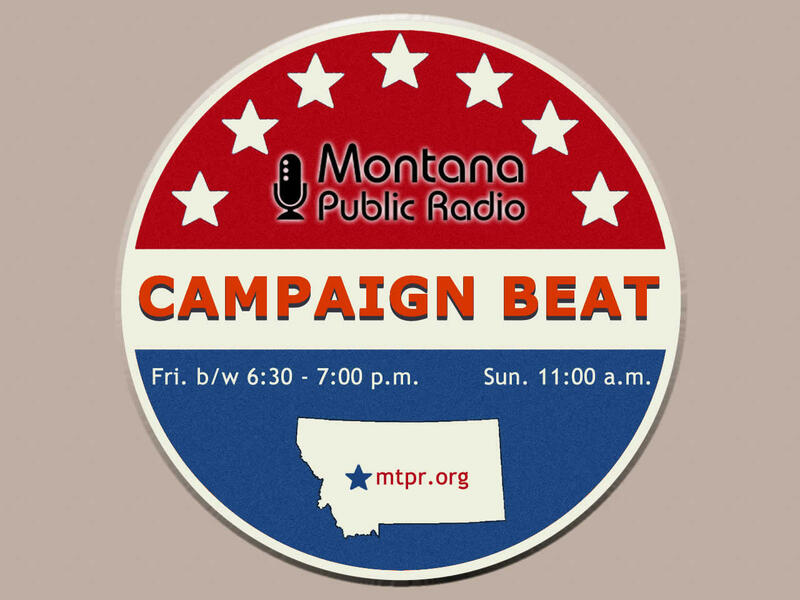 SM: You've been listening to 'Campaign Beat,' our weekly political analysis program. 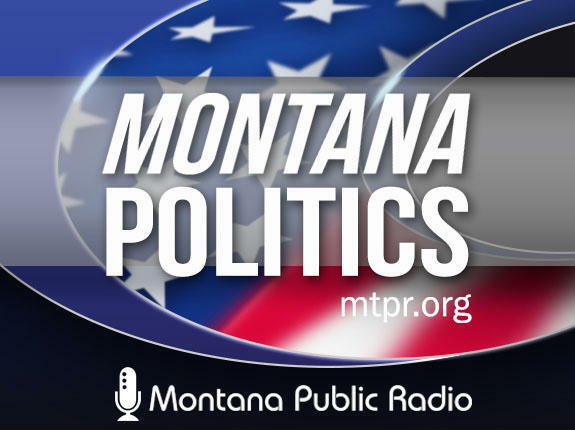 I'm Sally Mauk and have been speaking with veteran Capitol Reporter Chuck Johnson and University of Montana Political Science Professor Rob Saldin. Thanks guys and we'll talk again next week. 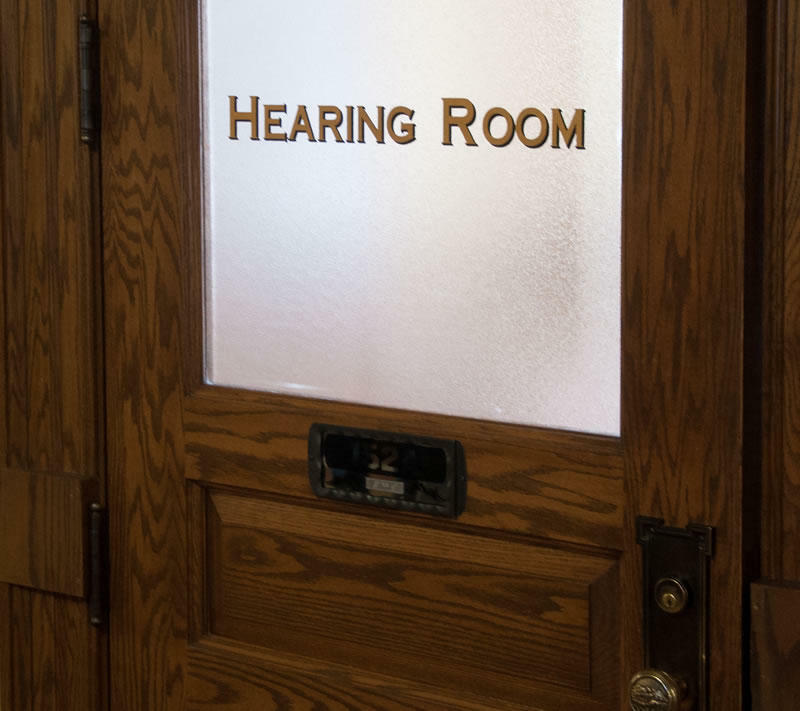 State lawmakers are considering dissolving the state workers compensation system, or turning it into a private entity. A public workers compensation insurance fund is written into Montana’s constitution.